Offbeat history, stories you probably won’t hear in school or anywhere else. For me, they’re what makes the past so entertaining! We have four more days before my next podcast episode goes online, so while you’re waiting for it, here’s another story about an obscure war that I recently added to the website. This one took place in Switzerland, believe it or not, and I added it to Chapter 13 of the European history series. We don’t get many opportunities to discuss Switzerland in a European history narrative, because the Swiss kept to themselves most of the time, and the outside world didn’t bother them much. The most recent outsider who did bother them was Napoleon Bonaparte, who conquered Switzerland in 1798, and turned most of it into a "Helvetian Republic." Then in 1803, because the Swiss refused to cooperate with him, he brought back the previous canton system, though the cantons remained satellite states of the French Empire until 1814. With the Congress of Vienna, Switzerland’s independence was restored, and Valais, Neuchâtel and Geneva were added as new cantons, establishing Switzerland’s present-day boundaries. Most important of all, the Congress declared Switzerland neutral, and the Swiss have followed this to the letter; they have not been involved in any foreign war since 1815, nor will they join any international organization. However, the Swiss could still fight other Swiss, and they did that once, in a conflict that was short and is now nearly forgotten. Thanks to Ulrich Zwingli, today’s Swiss population is predominantly Protestant, but a large Catholic minority remained after the Reformation era ended. In the 1840s a new liberal party rose, the Free Democratic Party of Switzerland. This party wanted a new constitution that would turn the Swiss Confederation into a more centralized state, and it wanted to reduce the power of the Catholic Church, especially in the schools. To protect their rights, seven cantons that were both conservative and Catholic formed an alliance called the Sonderbund ("Separate Alliance"). This was illegal according to the 1815 treaty and the constitution. The liberals ordered the alliance dissolved, and the Sonderbund members refused. Among the other cantons, fifteen supported the Bern government, and two were neutral. The resulting Sonderbund War lasted less than four weeks, in November 1847. The Protestants had the advantage of numbers, recruiting 99,000 troops to go against the Sonderbund’s 79,000. In response, the Sonderbund requested aid from the two strongest Catholic nations in Europe, France and Austria. Therefore, Bern’s strategy was to win the war as quickly as possible, before any foreigners could get involved. The Sonderbund began the fighting by launching two offensives, against Ticino and Aargau, but they failed to gain anything important before the government struck back. Those counter-offensives conquered Fribourg and Lucerne, and broke the Sonderbund forces. By December 1 the last Sonderbund canton (Valais) surrendered, and it was all over. There is nothing "civil" about most civil wars, but the Swiss managed to make the Sonderbund War one of the most polite conflicts of all time. The government army commander, Guillaume-Henri Dufour, refused to equip his army with Congreve rockets, a weapon the enemy did not have, because he felt the rockets would cause too much damage. And he actually let the other side know where he was planning his next attacks, in the hope that this would make them surrender before the attacks took place. In addition, a lot of people in the Sonderbund did not really want to secede from Switzerland, so when government troops entered rebel towns, they received a warm welcome. Finally, both sides had standing orders to give medical aid to wounded enemies. All this meant that casualties were minimal (60 federal troops and 26 rebels killed), and when a new constitution was introduced in 1848, one which turned Switzerland into the federal state that exists today, the Catholics were willing to give it a chance. In fact, they are still in Switzerland now. As for General Dufour, he went on to preside over the First Geneva Convention, which founded the International Red Cross in 1864. On the podcast, in the latest episode I mentioned America’s first war in Korea, the Shinmiyangyo Incident of 1871. Now here is another strange war in the 1800s that most people have forgotten, to the point that I just heard about it. On The Xenophile Historian, I have added it to Chapter 4 of the North American history series. One part of the South that wanted nothing to do with slavery and Reconstruction was Van Zandt County, in northeastern Texas. Almost no one in this county owned slaves, and they didn’t like the idea of fighting for someone else’s right to own slaves. When Texas seceded in 1861, some folks in Van Zandt County proposed seceding from Texas, so that like West Virginia, they could remain with the Union. However, the threat of military intervention by the state of Texas was enough to keep the citizens of Van Zandt from acting, for the duration of the Civil War. After the war, the citizens of Van Zandt decided that another thing they didn’t like was letting Union troops and carpetbaggers run around in the county. In 1867 Texas was readmitted into the Union, and a convention was held in Van Zandt to propose seceding from Texas, the Confederacy, and the United States of America! The county commissioners approved of this move, and drafted a declaration of independence, which looked a lot like the more famous 1776 Declaration of Independence. Naturally General Sheridan saw this move as an act of rebellion, and he sent a cavalry unit to deal with it. However, the heavily forrested terrain of Van Zandt County canceled the advantage cavalry normally has, and the rebels knew their home ground well enough to surprise their opponents. The first (and only) battle of the Free State War was won by the rebels, who ambushed and drove off the cavalry. Then, to celebrate the ultimate David-vs.-Goliath victory, the rebels gathered in Canton, the main town of Van Zandt County. At the party they drank too much, and while they were totally blotto, Sheridan’s troops returned, arrested the whole bunch, and built a stockade near Canton to hold them. You’d think that would be the end of the story, but it has an epilogue. One of the prisoners, a former Confederate soldier named William Allen, had a knife in his boot that was not discovered by his captors, and over the course of several days he used the knife like a file, wearing down the anklets restraining him until he could break them off. Around the same time the rainy season started, and the guards posted on the site were reduced to one, who did his best to keep an eye on the prisoners by simply walking around the compound. This allowed Allen to free the other prisoners while the guard wasn’t looking, and when they broke out of the stockade, most of them fled in two different directions, one group going north to the Indian Territory (Oklahoma) and the other going west to the neighborhood of Waco, TX. Arrest warrants were put out for all the prisoners that escaped, but Federal troops did not look very hard for them, and none were caught. Even Allen was able to return after most people forgot about the affair, and he spent the rest of his life as a doctor in Canton. As for the Feds, they departed as soon as they brought Van Zandt County back into Texas, considering their work complete. Nobody bothered to void the county’s declaration of independence, so technically the county is still independent. Today the county calls itself "The Free State of Van Zandt," though today it isn’t clear if it got that name from the 1867 secession, the 1861 secession attempt, the county’s lack of slaves, or some incident that happened even earlier. 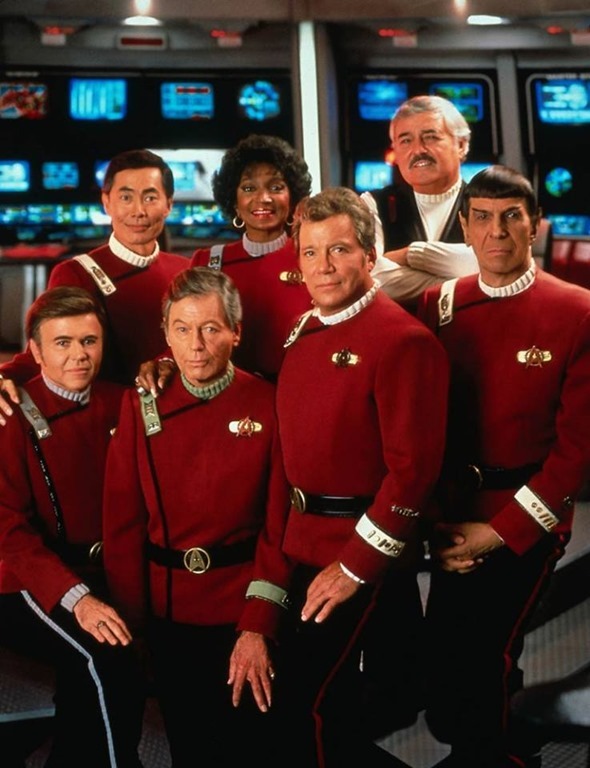 On this day in 1966, fifty years ago, Star Trek first aired on TV. Thank you for half a century of memories! Also, my brother reminded me that St. Augustine, Florida’s oldest city, was founded on this date in 1565. So I guess this means Happy 451st Birthday to my former home state as well! Along that line, I considered doing one of my own, but a lot of the good subjects are already taken. There are good podcasts on the Romans, the Chinese, the Egyptians, the Russians, military history, explorers, pirates, and so forth. There’s no reason why somebody else can’t try to do his own version of those subjects, but if I did that, I’m sure the comments from those who listened to both myself and the other podcaster would put me in competition with the latter. Well, today I believe I found my niche in the history podcast business: Southeast Asia. Over on Facebook, the folks in a private group I belong to were talking about the latest archaeological discovery in Cambodia – the discovery of the city that was Cambodia’s capital before Angkor Wat was built – and somebody asked if there is a podcast on it yet. A Google search told me that the answer was no. Even with the Vietnam War, as important as that was for the United States, only individual episodes, not a full-fledged series, have been done so far. So there you have it. Over the next month I plan to read up on how to do this from podcasters who have done it already, and buy an appropriate microphone and whatever software is needed. Finally, I’ll look for a sponsor to make this worth the effort. If I go ahead with this project, will my regular readers listen? Greetings once again to all my loyal readers! Charles Kimball is here again, to give you the latest news on my world history website. It has been nine months since I wrote you, and I don’t know about you, but they have been difficult months for me. I lost my job last spring, I haven’t found another one yet, and there have been two deaths in my family: my father in July and my uncle in September. Of course I’ve been hoping 2016 will go better, but look at the news; what a roller coaster ride this year has been so far! But the main purpose of this newsletter is not to tell you about my troubles, it is to tell you what is new on the website, "my other child," so to speak. Uh, maybe I should stop calling it that, since as of last December, The Xenophile Historian turned eighteen years old! How long is that in Internet time, more than a century? Anyway, I have continued to work on it, especially now during those winter days when my wife and I are snowed in. Read on to find out what has been added. Long-time readers will know that the main announcement in each of these newsletters is usually a new history paper on the site. That is true here, but when it was completed, I did not send out this newsletter right away, because I did not want the new chapter to be the only item worth mentioning. Anyway, over the course of 2015 I wrote a third chapter to the growing South Pacific history series, this time covering the years from 1781 to 1914. I called it "Pulled Into the Modern World," because this was when Europe and the United States spread Western civilization to the South Pacific. At the beginning of this period, the explorers of the Pacific Ocean were nearly finished with their work, so hunters, merchants and missionaries took their place. Finally six nations (United States, Great Britain, France, Germany, Spain and the Netherlands) divided the lands and seas of this region between themselves. In the first decade of the twentieth century, Australia and New Zealand went from being British colonies to independent members of the British Commonwealth of Nations, but the other islands of the South Pacific will not become independent until the final chapter of this work — if they become independent at all. My oh my, I did not know what I was getting into when I began doing the research for Chapter 3! Because Chapters 1 & 2 were not all that long, I expected Chapter 3 would be the same. But when I hit the books and read up on this period, I found out how little I really knew, especially on the New Zealand wars between the Maori and the settlers, and the exploration of the Australian outback. To do the subjects justice, what I ended up writing was nearly as long as the history papers I did in 2010-14 on my previous project, the history of Latin America. And because I stopped with 1914, the year that World War I began, now I am wondering if it will be better to write one chapter or two, to cover the final century before the present. There’s Gold Down Under . . . In January, I added Paypal links to most of the pages on the website with the words “Support This Site!”, so that those who feel inclined can make financial contributions. I got the idea from the podcasts I have been listening to lately; they are supported by either donations or advertising. The donation buttons will serve the same reason as the Google ads on my webpages. Don’t worry, I plan to keep the content on the website free, except for what goes into any future books I write. You may consider the donation buttons the online version of the jar near a musician or sushi chef in a restaurant; if you like what you see and want to encourage me to produce more, feel free to leave a tip. And finally, at the end of January, I discovered a new social network, Tsu.co, which shows promise. While it works a lot like Facebook, they don’t allow the worst nonsense, like spam and chain letters. Also, any original content you post there (messages, pictures, etc.) is yours to keep, and they pay you a little money for your postings. Check out Tsu and see if it is for you. I look forward to seeing you there! Here is your Tsu invitation. So what am I planning for 2016? Mainly completing as much as I can on the South Pacific history, of course. With the Chinese pages updated, maybe I will update the Russian pages next, because Russia and neighbors like the Ukraine have been in the news so much. And then maybe I will tackle Central Asia, and achieve my life goal of writing the history of just about everybody. May 2016 be a better for you than 2015 was, and keep on reading! 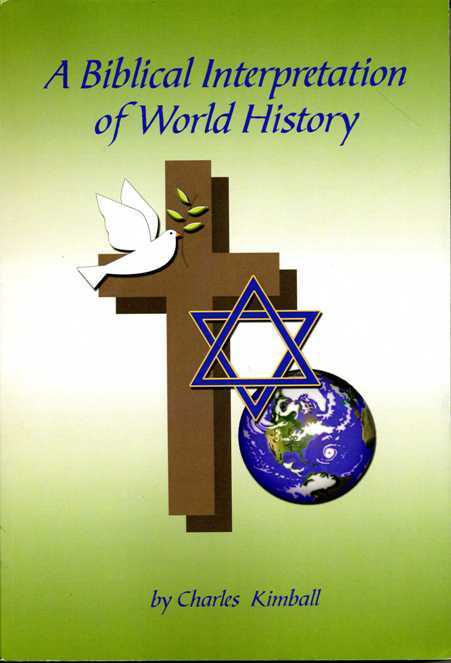 If you missed older issues of this newsletter and want to see them, they can be downloaded in a zip file from http://xenohistorian.faithweb.com/download/index.html . What you read next will probably go down as the silliest story in this work. 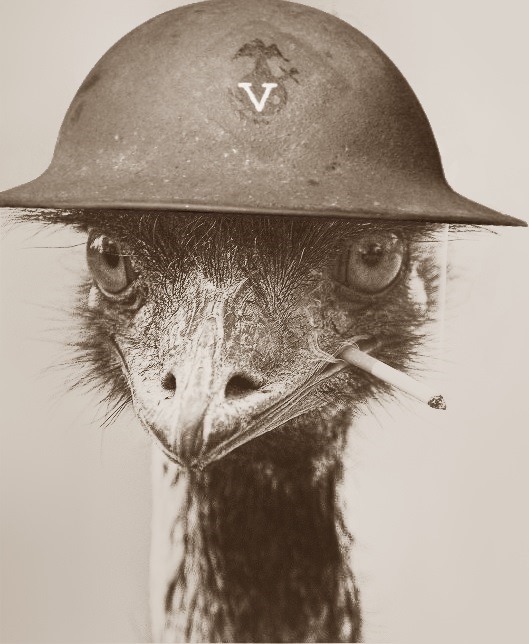 Elsewhere I have talked about stupid battles and wars; for the South Pacific, the stupidest conflict was the brief Emu War of 1932. Be warned, what you are about to read did not come from The Onion. Here, in one picture, is everything you need to know. During World War I, the Australian government was looking for a good way to reward the troops for their military service, and maybe provide jobs for them, since most were not likely to stay in the armed forces after the war ended. They decided to offer tracts of land and money to any ex-soldiers who wanted to become farmers, and 5,030 veterans accepted it. However, some of the land was in desolate Western Australia, where growing wheat and raising sheep is only barely possible. Besides the desert conditions, it was hard to turn a profit during the Great Depression, when a bad economy kept the prices of their crops down. And on top of that was the emu problem. I mentioned in Chapter 1 that flightless birds have a hard time surviving when humans move into their neighborhood. That is the case with the ostrich-like emu, and in most of Australia they are a protected species for that reason. 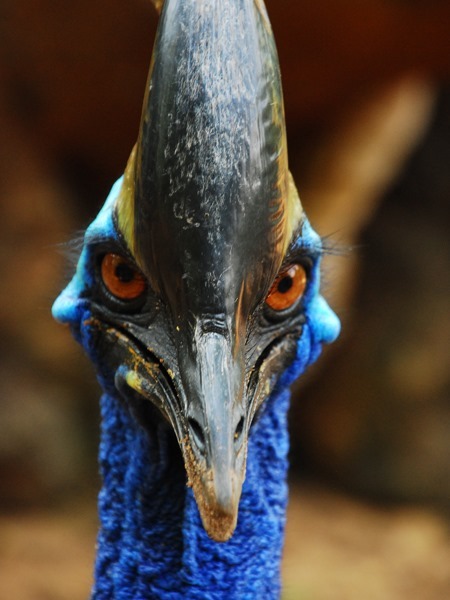 But not in Western Australia; that state took emus off the protected list in 1922, after they developed a taste for wheat, and started eating up the crops of the farmers. They were also attracted by the water supplies set up for the farms. Finally, when the emus ravaged a crop, they left holes in the fences that let in the pesky rabbits. Being former soldiers, the farmers resorted to shooting the birds, killing 3,000 in 1928 alone. It wasn’t enough, and in 1932 an estimated 20,000 emus descended on the farming districts of Chandler and Walgoolan, a few miles inland from Perth. Normally the Minister of Agriculture is expected to deal with a farm-related crisis, but the ex-soldiers did not trust him, and instead sent a delegation to the Minister of Defence for help. This gentleman provided two Lewis machine guns, 10,000 rounds of ammunition, and two soldiers to use them. Major G. P. W. Meredith would lead what was now a military expedition, and he would also bring a news journalist to film it. Against battle-hardened soldiers and up-to-date weapons, what could a flock of dumb birds do, even a very large flock of very large, dumb birds? 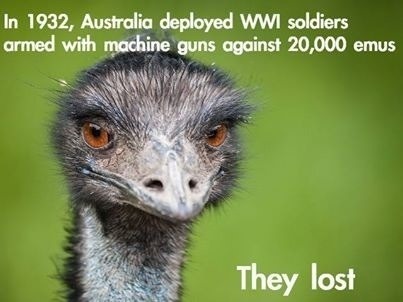 Naturally everyone expected this war on emus would be a glorified turkey shoot. They had underestimated their opponents. On the first day, November 2, the gunners shot at a group of fifty birds, but they dispersed, running off in different directions, and the few birds hit by bullets were only wounded, thanks to their thick skins. Two days later, they tried to ambush a thousand emus near a dam; this time they killed twelve of the enemy, the rest scattered again, and then the gun jammed. At one point it looks like Major Meredith couldn’t take any more humiliation from the birds, because he mounted one machine gun on the back of a truck so they could chase them. How did that work? Not too good! The emus could outrun the truck, the ride was so bumpy that the gunner couldn’t aim at anything, and the chase ended when the truck hit an emu and its body got tangled in the steering wheel, causing the truck to go off the road and crash into a fence. "If we had a military division with the bullet-carrying capacity of these birds it would face any army in the world. They can face machine-guns with the invulnerability of tanks. They are like Zulus whom even dum-dum bullets could not stop." Still, something had to be done about the emus. The government found it got better results when it just gave the farmers the bullets they needed to hunt the birds, and offered a bounty for each one shot. In 1934 the locals bagged 57,034 emus, and by 1960 the population had been culled to a point that the emu could become a protected species again. From Scientific American, The Great Emu War: In which some large, flightless birds unwittingly foiled the Australian Army. “New Strategy In A War On The Emu,” from The Sunday Herald, July 5, 1953. In the Gulf of Guinea, the Spanish-ruled island of Fernando Póo became the site for a secret mission. German submarines were refuelling somewhere in the rivers of the Vichy French-ruled colonies; the British Admiralty wanted to know where the sub base was, and what else the Axis was doing in West and Equatorial Africa. They figured the best way to get the intelligence they wanted was to steal the Axis ships currently anchored at Fernando Póo: an Italian merchant ship, the Duchessa d’Aosta, the German tugboat Likomba, and a yacht owned by a Spanish fascist, the Bibundi. To do this they sent a commando unit from the Special Operations Executive (SOE), an organization set up in 1940 to conduct espionage, sabotage and reconnaissance missions behind enemy lines. Few people at the time knew the SOE existed, and those who did gave it nicknames like "the Baker Street Irregulars," "Churchill’s Secret Army," and the "Ministry of Ungentlemanly Warfare." What made this mission tricky was that Spain was a neutral nation, and it might join the Axis if the agents committing the heist blew their cover. The mission was called Operation Postmaster, and it began with the agents sailing from Lagos, Nigeria to Fernando Póo on two tugboats. On January 14, 1942, they sneaked into the Spanish harbor, making sure they arrived on a moonless night and that they came after the harbor lights were turned off. Other agents distracted the harbor guards and the officers of the ships by inviting them to a big party at the local casino, where lots of liquor was served. While the party went on, the commandoes boarded the ships, and surprised the crews so completely that they surrendered without a fight. Then they set off explosives to break the chains holding the ships to the docks, and the British tugboats took off, heading back to Lagos with their prizes in tow. Of course the folks at the party heard the explosions, but they were either too drunk or too shocked to keep the commandoes from escaping. The Spanish government was furious when Madrid got the news, and called it "an act of piracy," but there wasn’t enough evidence to prove that the British government had planned the caper — which is exactly how London wanted it. For more on Operation Postmaster, here is a page about one of the agents involved. I wrote about it here in detail because this and other stories about the SOE inspired Ian Fleming, a British naval intelligence officer. After the war, when Fleming wrote his James Bond novels, he modeled the James Bond character after members of the SOE. A lot of today’s pop culture came from that, not to mention careers for actors like Sean Connery, Roger Moore, Timothy Dalton and Daniel Craig.